On May 8, 1945, World War II ended in Europe and this year, 2015, marks the 70th anniversary of V-E [Victory in Europe] Day. While jubilant celebrations took place throughout the world, others lived this moment in a more quiet and reflective way. Yesterday we received an email from a WWII vet, blogger and former POW, James Baynham, in which he shared his own personal V-E Day experience. James C. Baynham served in the USAAF as a B-24 pilot in the 445th Bombardment Group (H) in the European Theater of Operations. 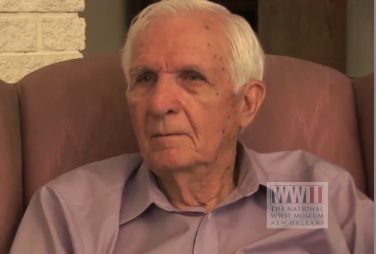 Baynham flew 11 missions before being shot down on September 27, 1944 during the raid on Kassel, Germany when hundreds of German Fw190 and Me109 fighters attacked his squadron. He was captured and spent seven months in Stalag Luft I.
Jim Baynham with his B-24 Crew. Jim is in the second row, second from the right. The months between January and May 1945 were some of the harshest for American POWs in Europe. The severe weather, overcrowding, forced marches, and mistreatment by captors who were on the brink of defeat all took a physical and mental toll on the POW population. In Europe during WWII, 1, 121 American prisoners of war died while captive, most in the waning months of the war. By 20 May 1945, all surviving American POWs were back in US hands, some held weeks after war’s end by Soviet forces. Tomorrow will be V-E day. And those days seventy years ago are surprisingly fresh in my mind. I was three weeks shy of having my 21st birthday and woke up the morning of the seventh in a soft feather bed in Wismar, Germany. It was a town that British troops had taken, and I had arrived the day before after trekking through about 60 kilometers of Russian controlled territory. 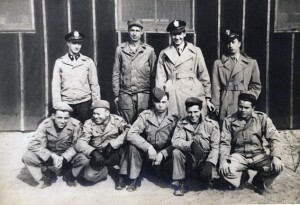 Pat Murphy, a fellow POW and I had left Stalag Luft One and made our way to Wismar on our own. We weren’t sure how we were going to get home but we figured if we kept going West we would find American troops and now, lying in luxury, out of the dangerous land of Russian convoys and safely in Allied territory, we were really and truly safe and for sure would see those beautiful G.I.s later that day. About a quarter million German troops had come to this town also, fleeing capture, and certain death by the Russians. They probably felt as relieved as Pat and me, but they were camped in fields all around the town while we were snug in bed. In a few weeks we would be home, but right then, seventy years ago this morning, we were good! More of Baynham’s story can be heard in his full oral history interview on our Digital Collections site. To read more about POWs in Europe, see Guests of the Third Reich: American POWs in Europe. Jim was one of our “Guests of the Third Reich Special Guests,” who visited the Museum during the exhibit’s run. Post by Chrissy Gregg Baynham and Kimberly Guise and Special Guest Jim Baynham.